Alice : I’m afraid so. You’re entirely bonkers. But I’ll tell you a secret. All the best people are. — John F Kennedy, 35th President of the United States, from a speech delivered to the American Newspaper Publishers Association on April 27, 1961 and known as the “Secret Society” speech (click here for full transcript and audio). Located in the center of each city is an Egyptian obelisk erect. 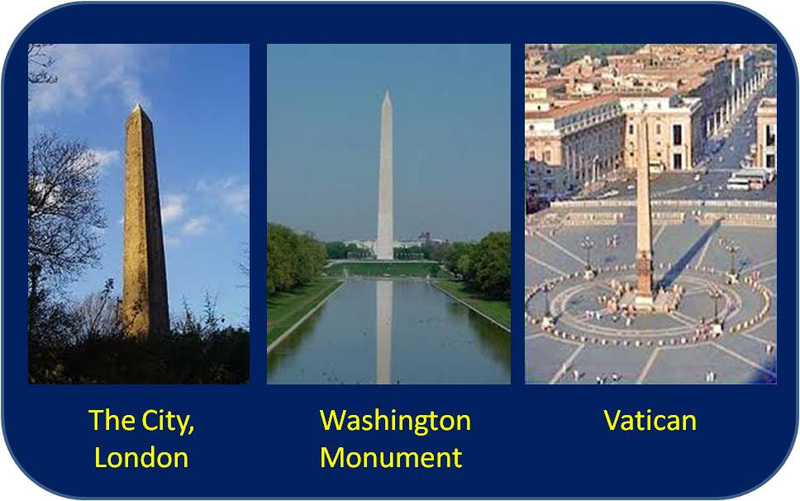 They are: the obelisk in St. Peter’s Square, the Washington Monument, and Cleopatra’s Needle in the City of London. Of course, one question you might want to ask yourself is why is there an Egyptian obelisk, which is a tribute to the Egyptian “pagan” sun god Amen-Ra, in the middle of Vatican City? Contained within these three cities is more than 80% of the world’s wealth. One of their means of control is to have agents of their cause in high places of influence. This cabal of powerful manipulators is known collectively as the Illuminati, the Shadow Government, the Omega Agency, the Government within the Government, and so on. It does not matter what they are called. They are there and have been actively and legislatively writing away our freedoms and also have been working towards the New World Order. Examples of this is the Patriot Acts, H. R. Bill 1955, the European Union Constitution, and the Security and Prosperity Partnership. Empire States are “sovereign” — operating above all other nation states, whose installed leaders MUST make pilgrimage to Rome and do obeisance before their earthly king. The President of the United States and a grinning Secretary of State observe the Speaker of the House kissing the Pope’s ring. Why is Washington D.C. not a State and legally a separate city-state entity apart from the United States of America? Why is the one square mile of the City of London, which has all the banks, with its own Mayor, a separate city-sate entity from all other England? Why does the Vatican have its own country code, where the entire city-state entity is guarded by Swiss Guards and shares no laws with Italy? Where Switzerland has never been involved in wars, where banksters go for secret accounts to hide their wealth??? So how are these three cities ultimately connected? We must first go back to the Knights Templar and their initial 200-year reign of power. The Knights Templar were first called “the Poor Fellow-Soldiers of Christ and the Temple of Solomon.” This is a blatantly misleading title, considering the immense wealth and power of the Templars, who operated 9,000 manors across Europe and owned all the mills and markets. 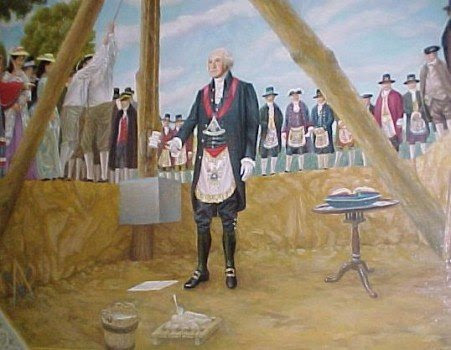 Anytime you hear somebody refer to the Bar Association, they are talking about a British/Masonic system that has nothing to do with a country’s sovereignty or the constitutional rights of its people. This is why, when you go to court in the US, you see the US flag with a gold fringe, denoting international rule. The government of the United States, Canada and Britain are all subsidiaries of the crown, as is the Federal Reserve in the US. The ruling Monarch in England is also subordinate to the Crown. The global financial and legal system is controlled from the City of London by the Crown. The square mile making up the center of Greater London is the global seat of power, at least at the visible level. , which officially established the United States as a corporation under the rule of Washington, which itself is subservient to the City of London. Corporations are run by presidents, which is why we call the person perceived to hold the highest seat of power in the land “the president.” The fact is the president is nothing more than a figurehead for the central bankers and transnational corporations (both of which themselves are controlled by High Ecclesiastic Freemasonry) that really control this country and ultimately call the shots. Most U.S. citizens believe the United States is a country and the president is its leader, but the U.S. is not a country, it is a corporation, and the president is not our leader, he is the president of the corporation of the U.S. The president, along his elected officials work for the corporation, not for the American People. 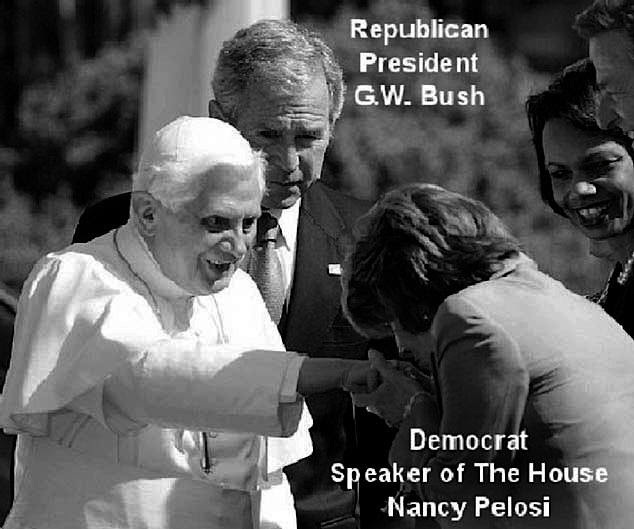 The Religious Control: The Vatican. pop. 1,000 people. 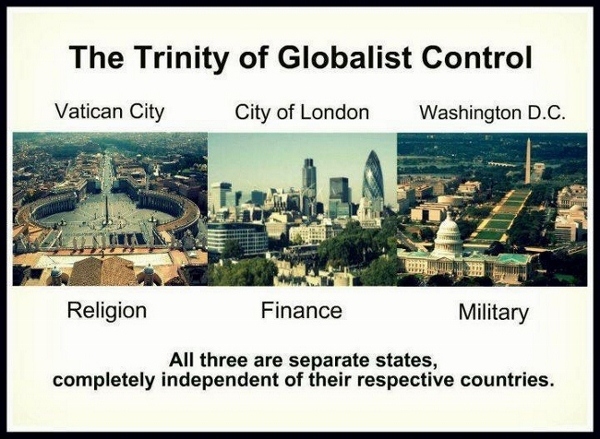 The Banking Control: The City of London aka The Crown 11,000 people. For centuries the Bank of England has been center of the worlds fraudulent money system, with its “debt based” (fiat currency) – the Rothschild banking cartel has maintained tight-fisted control of the global money system through The Bank for Intl. Settlements (BIS)Intl. Monetary Fund (IMF) and World Bank, the central banks of each nation (Federal Reserve in their American colony), and satellite banks in the Caribbean — they determine w/the stroke of pen the value of ALL currency on earth it is their control of the money supply which allows them to control world affairs (click here for Federal Reserve owners) — from financing both sides of every conflict, through interlocking directorates in weapon manufacturing co.s’, executing global depopulation schemes/crusades/genocide, control of food supply, medicine and ALL basic human necessities – they have groomed their inaudibility through control of the so-called “free press” and wall themselves off w/accusations of anti-Semitism whenever the spotlight is shone upon them — their Zionist tentacles reach into every major financial transaction on earth…unchecked power! 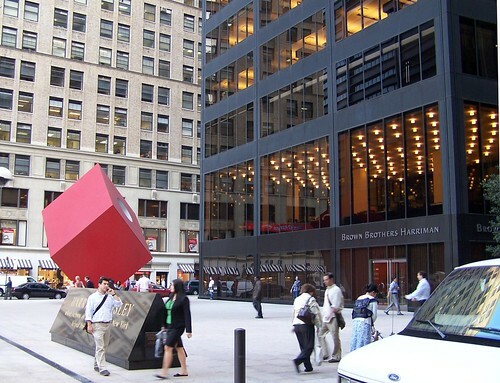 * 70 banks from the United States are located in The City . This gave the Rothschild family complete control of the British economy – now the financial centre of the world and forced England to set up a revamped Bank of England with Nathan Rothschild in control. names included in the London based corp. are names like: Rockefellers, Gore, Greenspan, Kissinger, Krugman (NYTimes),Powell, Gates, Buffet, Bush, etc. Why are these ‘American’s’ on a foreign committee…because the Crown STILL owns the UNITED STATES CORPORATION, private corporation! along w/their oil oligarchy Exxon-Mobil (formerly multi-headed colossus Standard Oil) click for Ida B. Tarbell expose they also manage Rothschild oil asset British Petroleum (BP) The Crown Corporation holds title to world-wide Crown land in Crown colonies like Canada, Australia, New Zealand and many Caribbean Islands — British parliament and British PM serve as public front for hidden power of these ruling crown families. The U.S.A. is a Crown Colony — careful study of signed treaties/charters between Britain and U.S. exposes a well-kept secret – U.S. has always been and remains a British Crown colony. King James I not just famous for translating the Bible into “The King James Version”, but for signing first charter of Virginia in 1606 — which granted America’s British forefathers license to settle and colonize America — also guaranteed future Kings/Queens of England would have sovereign authority over all citizens and colonized land in America, stolen from Native Americans via genocidal methods — its farming industry/infrastructure was developed by Africans “stolen” from their homeland, classified as property and relegated to sub-human status. After America declared independence from Great Britain, the Treaty of 1783 was signed treaty identifies King of England as prince of U.S. – completely contradicting premise that America won The War of Independence — though King George III gave up most of his claims over American colonies, he kept his right to continue receiving payment for his business venture of colonizing America — if America had really won War of Independence, they would never have agreed to pay debts and reparations to King of England. America’s blood soaked War of Independence against British bankrupted America, turning its citizens into permanent debt slaves of the King. In the War of 1812, British torched and burned to the ground White House and all US government buildings, destroying ratification records of US Constitution. Most US citizens have been fooled into thinking U.S. is a country and POTUS is most powerful man on earth – U.S. is NOT a country, it is a corporation (colony) and POTUS is president of “The Corporation of the United States” – he along w/his officers (cabinet officials) and elected officials (congress) work for the corporation, NOT for American people (sheeple, masses, useless eaters etc). Since U.S. is a corporation, who owns the corporation of the United States? Like Canada/Australia whose leaders are Prime Ministers of the Queen, and whose land is called Crown Land, U.S. is just another crown colony — Crown colonies are controlled by Empire of the three City States. The centers of all three branches of the federal government of the United States are in the District, including the Congress, President, and Supreme Court. Washington is home to many national monuments and museums, which are primarily situated on or around the National Mall. The city hosts 176 foreign embassies as well as the headquarters of many international organizations, trade unions, non-profit organizations, lobbying groups, and professional associations. A locally elected mayor and 13-member council have governed the District since 1973; however, the Congress maintains supreme authority over the city and may overturn local laws. 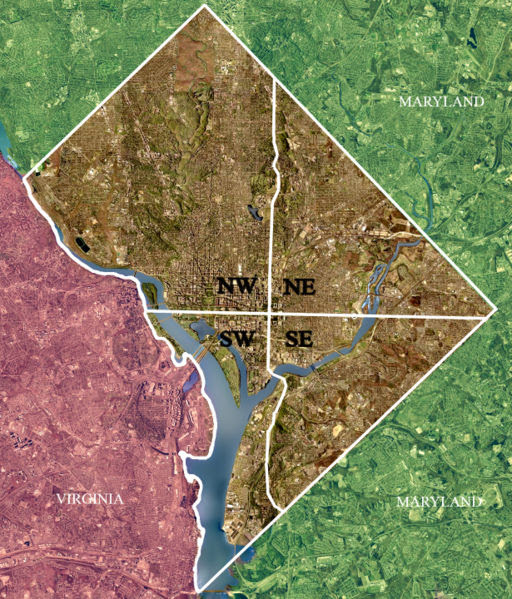 The District has a non-voting, at-large Congressional delegate, but no senators. The Twenty-third Amendment to the United States Constitution, ratified in 1961, grants the District three electoral votes in presidential elections. Another means of control is through the world’s Central Banks. Contrary to popular belief, the Federal Reserve is NOT a part of the US Government. The only part that is “federal” about it is it’s name. It is a privately owned enterprise, and so is the Bank of England, and every central bank out there, including the World Bank. Interestingly enough, all of these private central banks are owned by largely the same group of people! This group includes, but is not limited to: the Rothschilds, the Rockafellers, and the Warburgs and their interests. Essentially what they have is a monopoly on money. All money that is out there is a loan. The central banks print the money, and then loans it to the government on interest. This is why the national debt of any country grows exponentially. This is because the money that is needed to pay back the loan comes from the central bank.. on loan! The American national debt is so great right now that every person born into the US is automatically over 70,000 in debt. This way of control is to make every citizen of the colony a willing debt-slave of the Empire. I foresee that the manufactured economic crisis of right now in the US will be used as grounds to push for a North American Union and the use of a single North American currency (to enslave an entire continent) called the Amero. so we pay taxes to a privately owned foreign corporation based in the City of London folks! When we make a check out for tax payment in CA, we make it out to the ‘Franchise Tax Board’, a subsidiary of the USA Corporation, a private corporation. In the USA the Federal Reserve Bank is owned by 8 families, most live in Europe, they pay NO TAX on the Trillions of Interest they generate from the National Debt of the USA, which enslaves the US People. The IRS is a Collection Arm of the Federal Reserve Bank, the IRS is NOT an Agency of the US Government. The Federal Reserve is not Federal nor does it have any Reserves, its main asset is the Bonds received from the US Government which give the US Government the power to spend the money created from the monetization of the credit of each American used as collateral and then brought into circulation. During the Depression of the 1930′s the same Wall Street Bankers received bailouts just as has happened recently. When will the people of America wake up? Sorry, not seeing the conveyance of Vatican City circa 1929, playing into or outof the Rothschild Banks ie City of London, I have researched and found many documents behind the Crown Templar and City of London creating SSI, BC, Corporations etc.,. but only hearsay for Vatican City involvement. Mind you, I understand enough about where Ecclesiastic Law and Common Law were derived from thereof. The Vatican may have their wealth etc,., but I’m just not seeing them at the top of this heap. Please I ask in all sincerity. Every time I see post on “Vatican City rules ALL”, I come away disappointed because there is no meat to these convictions. And David Icke is a Rothschild shill, I’ve known most of my life Rothschild hates the Catholic Church, what better ammo than this. But I’m just a big girl evidently asking too big of a question. Can you deliver?